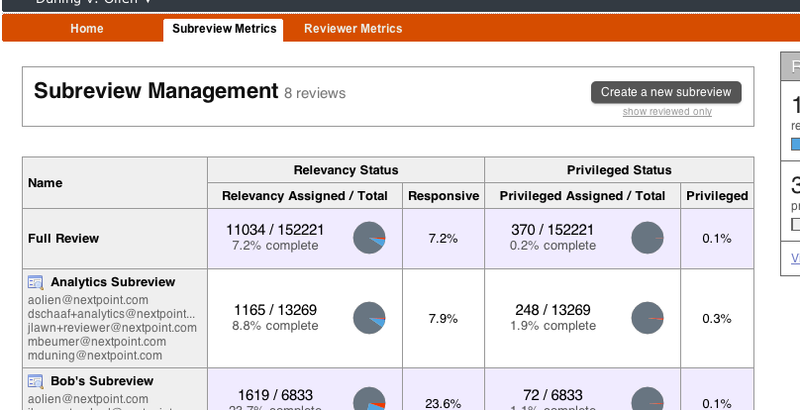 One feature of our recent Review Metrics release is the ability to keep closer tabs on your review at the Reviewer level. One (optional) tool in your set is the ability to track time for the purposes of calculating documents per hour reviewed. A Reviewer may clock themselves in/out with the click of a button on their landing page. If time was logged incorrectly, spent outside the system, or just plain forgotten: edits and full entries may be modified via the calendar interface (accessed via the “view” link in the screenshot above). The focus of Time Keeping is the documents-per-hour metric and does not aim to be a fully featured time management system. In that name, the system is flexible and does not provide locking, security, and audits that might appear in a true time-tracking tool. However, reports detailing the work done in a given day or month, by any given Reviewer, are available to advanced users — providing direct timestamps at which documents were reviewed. We hope you’ll find this change and the wider release that it is part of helpful in gaining visibility into the status of your review. 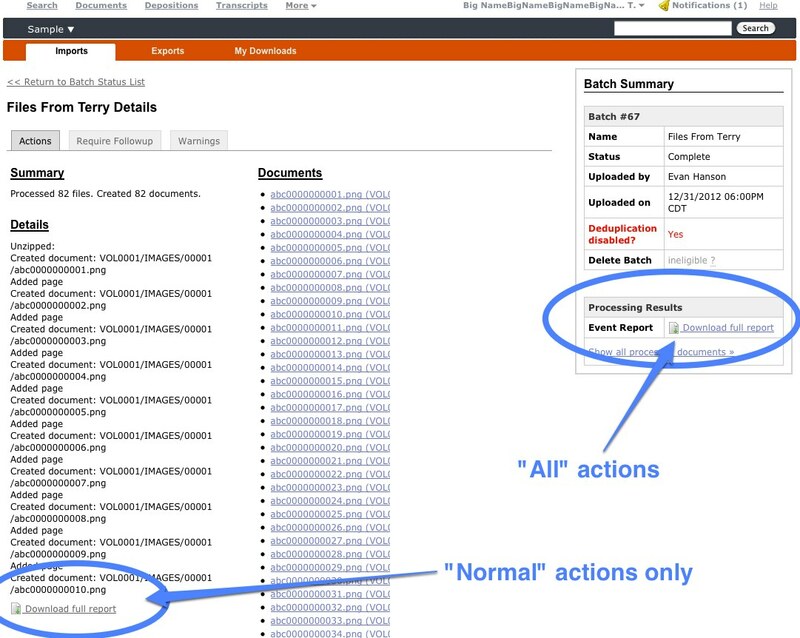 We’re excited to bring a significant refresh to the Discovery Cloud experience. The updates add clarity to your review at the Reviewer and Subreview levels and provide visibility into where progress is being made or where it may be lacking. The ability to more clearly differentiate between documents that are not yet reviewed for privilege and those that have been positively identified as “not privileged” facilitates privilege review in a way that was previously inconvenient. 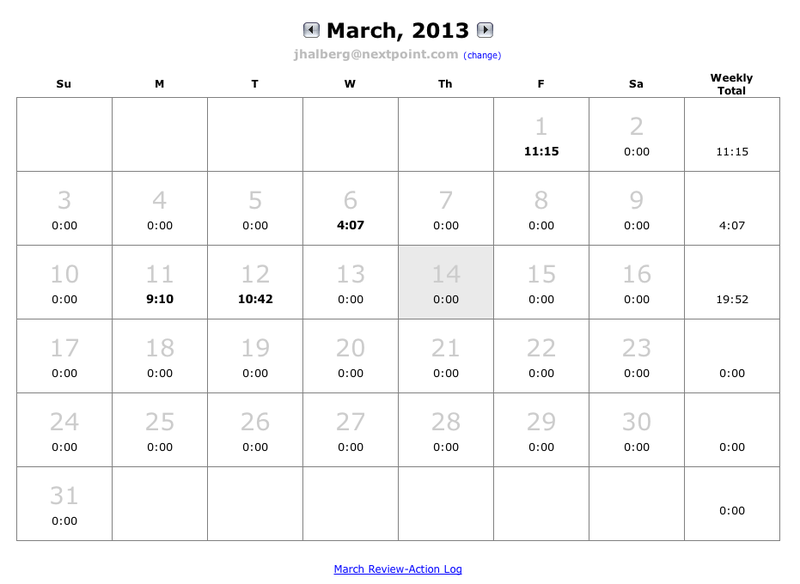 Available to Advanced-level users, a tab under “Admin” brings you status and counts at the Subreview level. Subreview level statistics illustrate progress and may provide insight on what area of your review is producing the highest quantity of relevant/privileged/etc documents. Many graphs may be clicked to gain an extra level of detail. 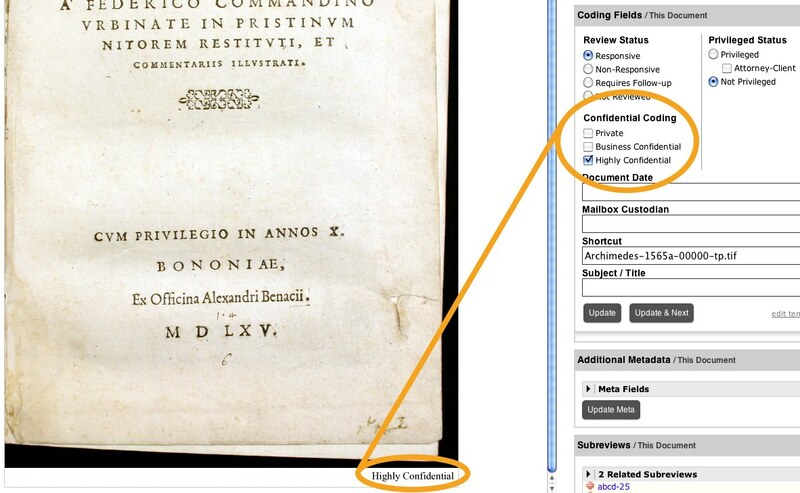 Available to Advanced-level users, a tab under “Admin” brings you status and counts at the Reviewer level. Statistics for each Reviewer provide visibility on what sort of work is being accomplished. If you elect to utilize the (new) Timekeeper functionality, a time metric is also available to give an indicator of review speed. As with Subreview Metrics, many graphs may be clicked to gain an extra level of detail. 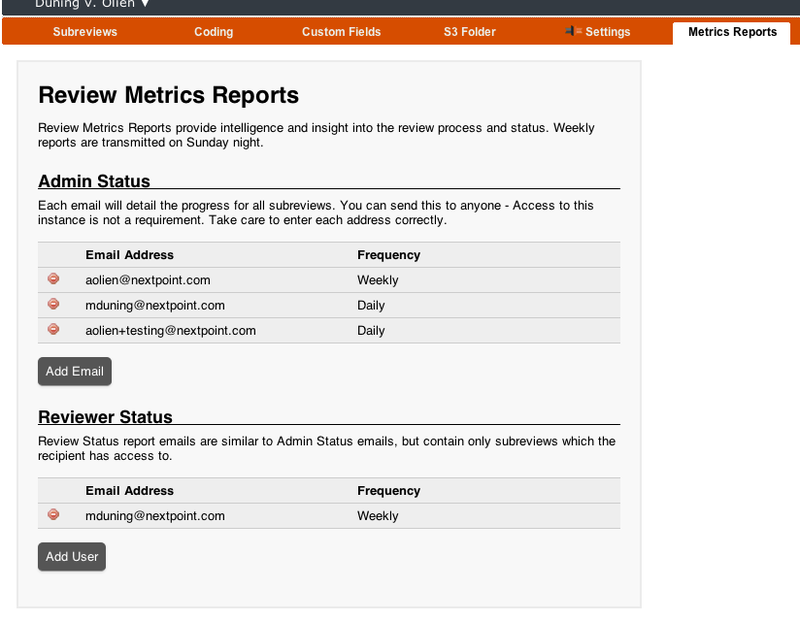 Available via Settings -> Metrics Reports, users may opt-in to status emails. A report will be generated and transmitted weekly, providing the recipient with the overall +/- subreview status of the review. These emails do not need to be tied to a Nextpoint account, freeing you up to transmit them to addresses of those not necessarily involved in the day-to-day review. Previously known as “Review Status”, “Relevancy Status” is concentrated on the relevant/not portion of a review. On the Privilege side, this enables differentiation between a document that is “not reviewed for privilege” and a document that has been reviewed for privilege and certified to truly be “not privileged”. Existing documents with a “Not Privileged” status have been marked as “Not Reviewed” for privilege. If you would prefer that those documents instead be “Not Privileged” – a simple bulk edit is all that is necessary to make that modification en masse. So, when do I get it? The update will be available to some users beginning Tuesday 3/19, with the remainder receiving the updates Thursday, 3/21. As with all updates, no action is necessary on your end. 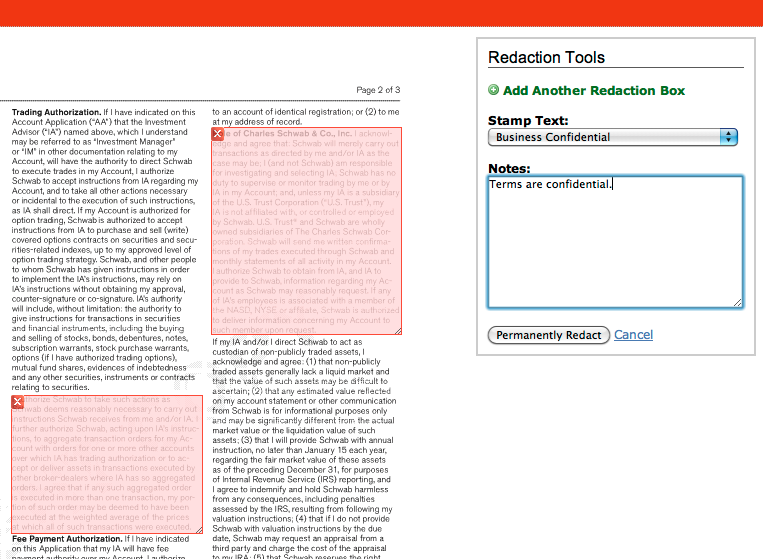 DiscoveryCloud now provides the ability to choose and configure your own redaction stamping text, giving you the flexibility to use the labels that make sense for you. 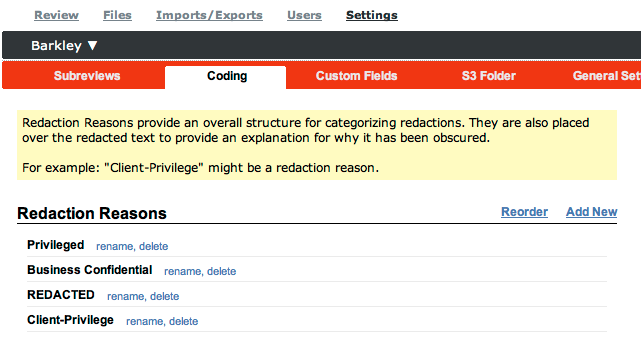 Advanced users may add, remove, rename, and sort Redaction Reasons in the Settings section. 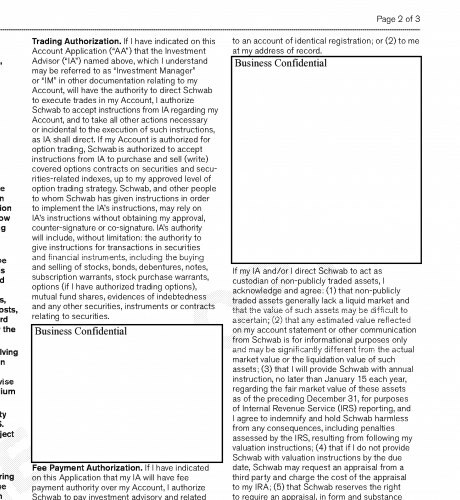 Redaction Reasons are immediately available for selection in the normal redaction interface. Processing completes a few seconds later, leaving a redacted box containing the desired text. The ability to customize redaction text puts the power to provide clarity (or ambiguity) in your hands, allowing you to craft the solution to fit your specific situation. 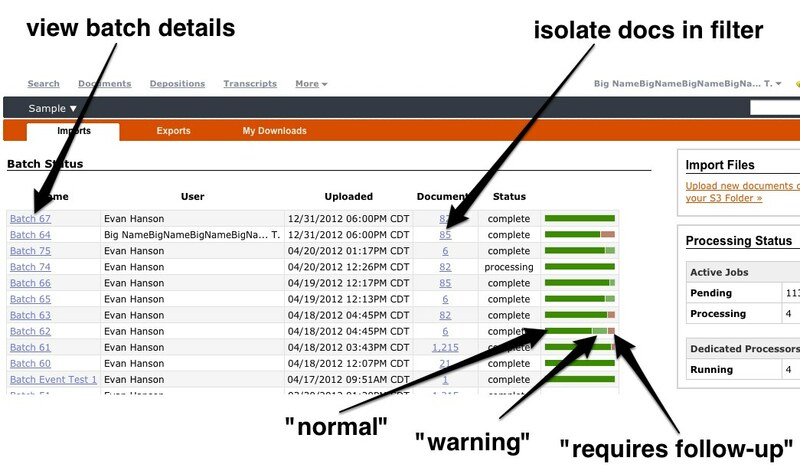 As mentioned in our Introducing Coding Templates post, Confidentiality Codes have arrived in DiscoveryCloud. The codes are fully customizable & sortable in the settings section or via the “Edit Template” link when reviewing documents. When reviewing documents, apply any applicable codes to mark and automatically stamp them. It’s quick and easy and won’t interfere with any bates stamping on the documents. We’ve been getting some great feedback since launching Grid View. Chief on the wish-list has been customization and we’re happy to bring it to you. The newest set of changes (available immediately) bring the ability to setup multiple templates, displaying what you want to see / how you want to see it. 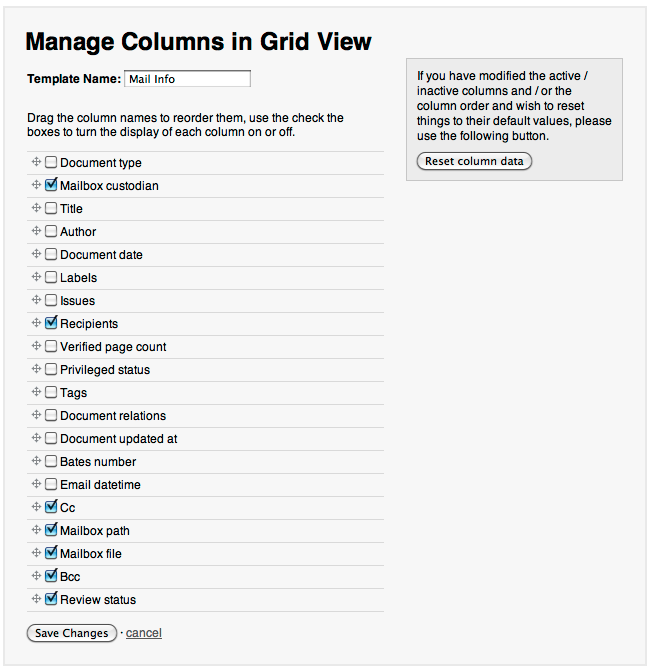 Setup a new template by selecting the columns that you’d like to see, in the order that you’d like them presented. Your custom fields are available, in addition to standard document fields. Choose the template that you’d like to use to view your results. Templates are configurable by any ‘Advanced’ level user and available for selection by all users.